National Officer Candidate Webinar TODAY! Please mark your calendars for the annual agriculture teacher recruitment and retention update for FFA National Officer candidates and stakeholders. Questions are encouraged and may be sent ahead of time to ethompson.naae@uky.edu. The session will not be recorded. Click here to register for the webinar. The National Teach Ag Campaign has selected 20 agricultural education majors from across the country to attend the Future Agriscience Teacher (FAST) symposium as a part of the National Association of Agricultural Educators’ (NAAE) annual convention in December. This group of future agriscience educators will spend five days receiving professional development that will help them in their future careers as classroom agriculture teachers. Click here for the full press release and to see who was selected. The NAAE room block at the Gaylord Opryland is full for Monday, Tuesday and Friday nights, December 4,5 and 8. You can check the ACTE housing block here to see if they have availability for those nights. Make sure to follow this link for all other NAAE Convention details. See you in Nashville!! Presented by Zoetis, the Veterinarians on Call YouTube channel features real-life vets doing a variety of tasks. This week, Dr. Wilson, veterinarian at Rose Acre Farms in Indiana, examines the flocks in his care by handling some of the birds. Click here to watch the video. Early Bird Convention and Expo Registration Ends Tonight! Registration for the 90th National FFA Convention & Expois underway. The early bird deadline is tonight at 11:59 p.m. EDT. Advisors: While you're registering, make sure you add the names of those attending. This step will save you time when you arrive in Indianapolis! Ag Teachers and FFA Advisors - Free Resources for Your Classroom! FFA Resume Generator © (recently upgraded with new features!) SAE Videos from FFA chapters around the countryBrowse through your free resources, bookmark the webpage and share with fellow agriculture educators! If you missed the live stream, the AgExplorer virtual field trip to Syngenta’s Research and Development Center is now available on-demand! Learn how analytics, chemistry, agronomy and biology are revolutionizing the way food is grown.Coming in November: Our next virtual field trip will focus on animal systems at FFA sponsor Zoetis. More details coming soon. If you are coming to convention this year, set aside some time to attend a leadership workshop or two. Workshop schedules are now posted online; both advisor and student workshop schedules and descriptions can be found on FFA.org/events/convention/schedule (scroll to the bottom of the page). Thirty-seven teacher workshops are being offered, in addition to those provided through the DuPont Agriscience Institute. Thirty-eight unique student workshops will be delivered—several offered multiple times—for a total of 93 student workshop opportunities. Does your FFA chapter have a service event that they want to host over the winter months or during FFA Week? This is a reminder that National FFA now has Day of Service Mini-Grants available to middle school, high school, and collegiate/alumni chapters to impact your community in one of four focus areas: Community Safety; Hunger, Health and Nutrition; Environmental Responsibility; and Community Engagement.Applications submitted by the last day of each month are reviewed and awarded by the 15th of the following month. Thus, applications submitted by October 30th will be awarded by November 15th. To learn more about the grant and access the application in English or Spanish, visit www.ffa.org/livingtoserve/grants. #TeachAgChats this Fall are on Thursday nights from 8pm EST to 9pm EST. They move quick! All are welcome, including: agriscience teachers, agriscience pre-service teachers, agriculture students, faculty concerned with advancing agricultural education, extension, leadership and communication strategies and ANYONE who believes in agricultural education!! Voting is now open for the 2017 CareerSafe Safety Educator of the Year! This award recognizes exceptional educators from across the country who have not only dedicated their time to prepare students for the future, but to also help students recognize and mitigate workplace hazards in their chosen careers. The winning educator will be announced at the CareerTech VISION ACTE Awards Banquet in Nashville,TN on Dec. 6th, 2017. 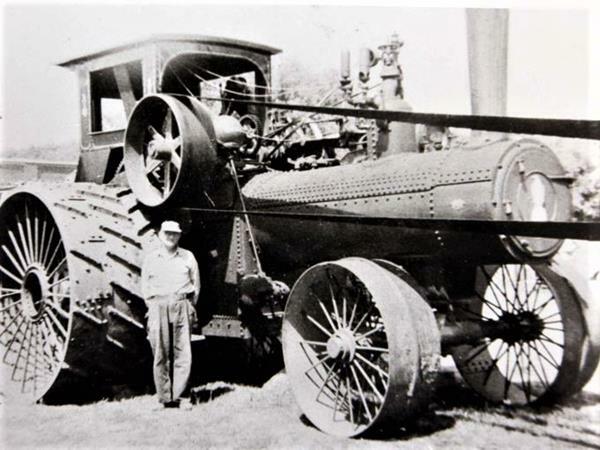 “Steam punk” down on the farm—check out the classic agriculture photos. Friday, Sept. 29, 2017: Agriculture groups try to manage misinformation, food security is threatened in storm-ravaged Puerto Rico, and why you should never turn your back on a praying mantis. Check out these and many more ag/science stories.